It’s been an interesting couple of weeks… Since March 19, characters from Middle-earth, and other roles played by the same actors, have been battling it out to claim the title Champion of Middle-earth March Madness 2018. We started with four brackets comprising roles from The Lord of the Rings movies, other roles by those same actors, roles from The Hobbit movies, and alter-egos for those cast members. 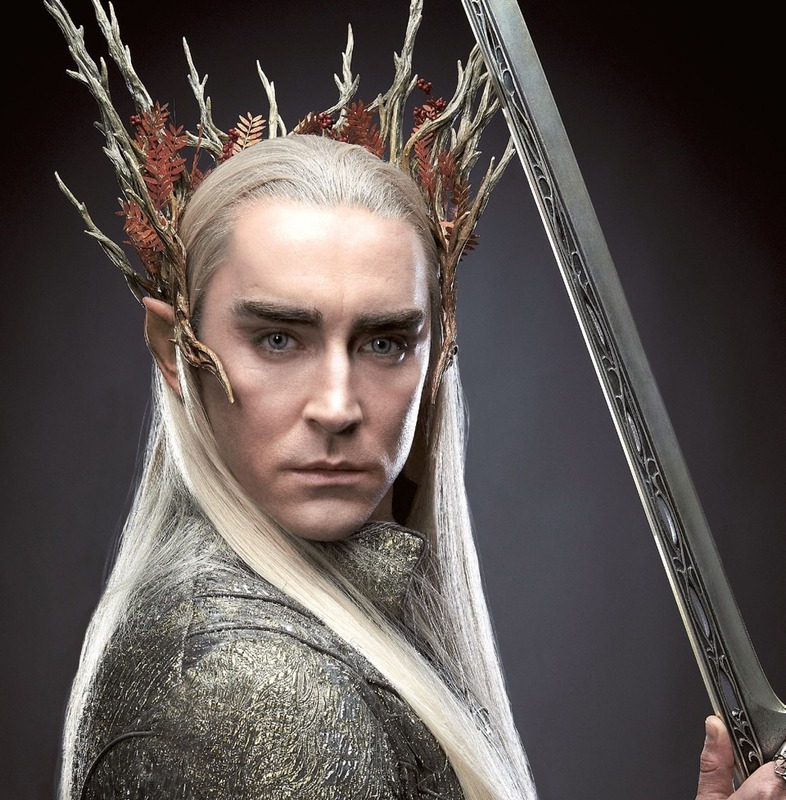 The brackets were mixed, to give actors a chance of coming up against ‘themselves’ – and indeed in Round 3 we did see Christopher Lee’s Saruman go up against his Count Dooku, and Lee Pace’s Ronan face his majestically-eyebrowed Thranduil. Boromir fell in the first round, defeated by Gimli, but Sean Bean’s Eddard Stark did make it all the way to Round 3, where he was conquered by eventual semi-finalist Samwise Gamgee. Sam made it the furthest of all the hobbits; Merry and Pippin both went out in Round 1, and Frodo fell to Aragorn in Round 2. Both Martin Freeman’s and Ian Holm’s Bilbos were knocked out back in Round 1; they had tough battles, being drawn against Gandalf and Faramir respectively. The elves fared rather better, with Galadriel, Elrond and Thranduil all getting through to the Elite Eight (though Legolas, alas, could not get past Aragorn in Round 1). Wizards Saruman and Gandalf joined the elves in Round 4; but poor Radagast was beaten by Dwalin way back in the first round. In the world of men, only Aragorn managed to get as far as the Elite Eight; Dr John Watson, Sherlock Holmes, Dr ‘Bones’ McCoy, Rudy, and Carl from Van Helsing all joined Eddard Stark in being vanquished in the Sweet Sixteen round. Middle-earth March Madness – The Final Four are Chosen! Just two rounds remain in this year’s Middle-earth March Madness – we’re down to the final four, facing off against each other in the Semi-Finals! Who has the strength to rule over all? Let’s take a look back at the Quarter Finals – where none of the battles was as tight as might have been predicted. In a pairing which presented voters with a tough choice, the stout-hearted hobbit overcame his long-shanked foe; Aragorn was defeated by Samwise, with the Ranger unable to claim much more than a third of the vote. This result may surprise some, but then, Master Gamgee has always proved to have hidden strengths and depths. Division II saw Galadriel going nuclear on Gollum, but still losing to the tricksssy one! Who would have thought that one of the River-folk could overcome a high elf, and a margin of two thirds to one third? The mighty Maiar match was also not the closely fought duel one might have expected; it must indeed have been Gandalf the White who entered the lists, as he thrashed Saruman, taking over 85% of the vote! Finally, in Division IV two elves faced off; a high (but half) elf against a woodland dweller. 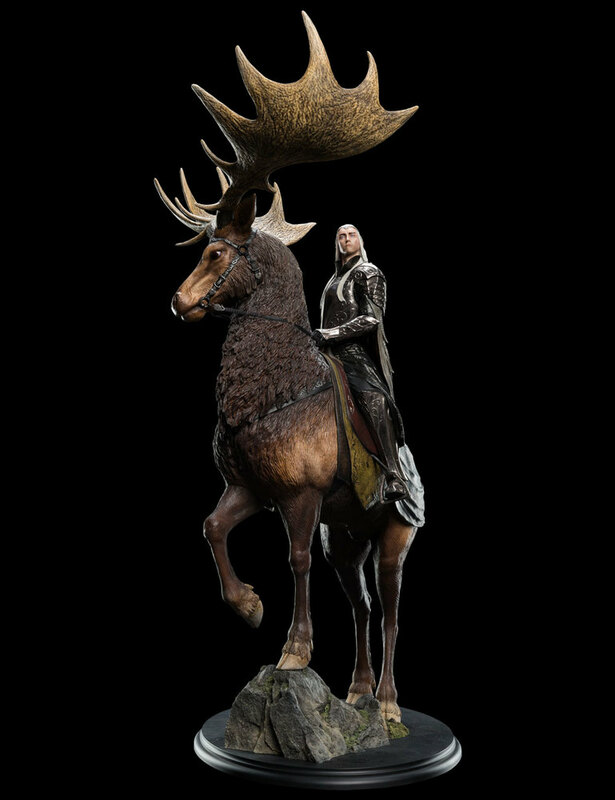 Thranduil may have ridden in on his war moose, but in the end, it was Elrond who came out victorious, claiming about three quarters of the vote. And now we are down to just FOUR. Samwise vs Gollum – there’s no love lost between these two! Will the faithful gardener be able to overcome ‘Stinker’, or if he lets his guard down, will Gollum defeat the ‘stupid, fat hobbit’? Will it just devolve into a contest of name calling?! You decide! Gandalf vs Elrond – will the wizard finally teach Half-elven a lesson, for failing to throw Isildur and the Ring in the fires of Mount Doom at the end of the Second Age? 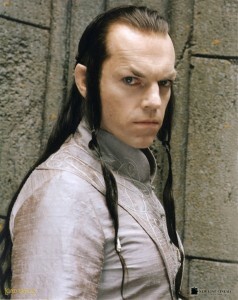 Or does Rivendell’s ruler have a trick or two up his voluminous sleeves? It’s up to you – VOTE NOW! The Elite Eight – Middle-earth March Madness 2018! And then there were eight… It’s Quarter Finals time in this year’s Middle-earth March Madness – and Round 3 was a decisive round indeed. The people have spoken, and made it clear that alter-ego interlopers shall go no further; every duel in the last round was won easily by the Professor’s creations. 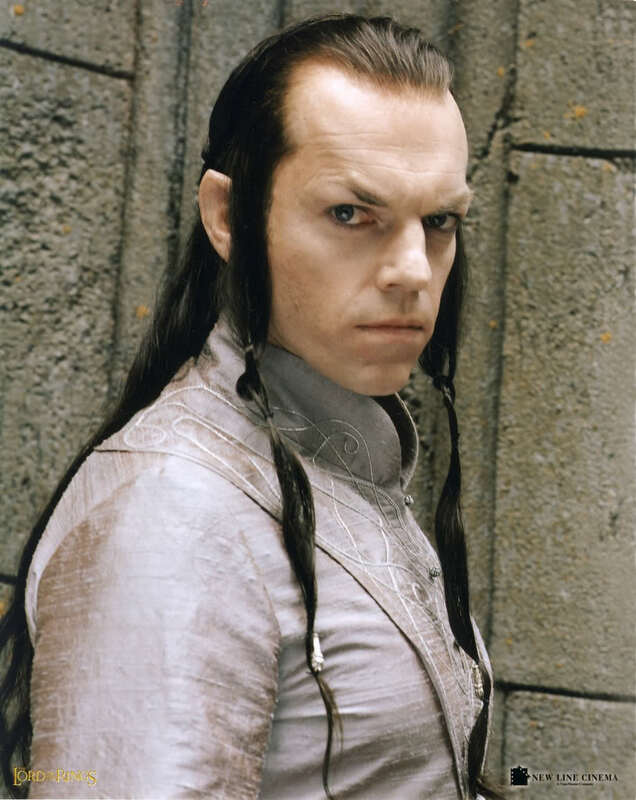 Benedict Cumberbatch’s Sherlock Holmes (Sherlock) put up the best fight, taking a third of the vote against Elrond. Only two other non-Tolkien characters managed to climb over 20%: Karl Urban’s Leonard McCoy (Star Trek) fought hard but was no real competition for Galadriel, with the high elf in the end claiming more than three quarters of the vote. Alas, another Sean Bean character bites the dust prematurely; Eddard Stark (Game of Thrones) clawed his way to almost 29%, but could not hope to defeat the valiant Samwise Gamgee. Martin Freeman’s John Watson (Sherlock) was thrashed by Gandalf, and David Wenham’s Carl (Van Helsing) received a similar humiliation at the hands of Gollum. At least, however, they made it into double figures; poor Rudy (Sean Astin) could only manage 7.13% against Gondor’s king. Aragorn’s triumph in that pairing will come as no surprise to anyone. It was perhaps the ‘schizophrenic’ contests which were most interesting in this round; Christopher Lee faced himself as both Saruman and Count Dooku (Revenge of the Sith), and we wondered which way Lee Pace fans would vote, when having to choose between Thranduil and Ronan (Guardians of the Galaxy). Once again, the Middle-earth characters reigned supreme; Count Dooku couldn’t even manage to wrestle 9% of the votes away from Saruman. 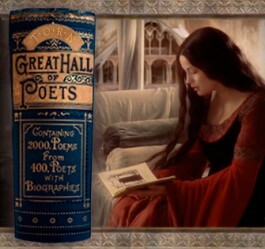 So here we are at Round 4 – denizens of Tolkien’s realm all the way! The choices are tougher now; does Sam stand a chance against Strider? Will Gandalf and Saruman throw some break-dance moves in their fight, and will Saruman come out victorious? (Is he facing Gandalf the Grey or Gandalf the White? – you decide!) In the mighty battle of the elves, can Thranduil of the woodland realm possibly pose a threat to Elrond Half-elven? And is there anything the tricksssy Gollum can do, to give him a chance against Galadriel? Middle-earth March Madness – onwards to Round 3! 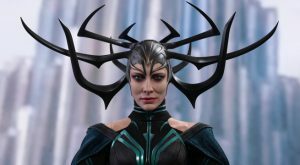 In Division II, Galadriel soundly defeated Faramir, but Cate Blanchett’s Hela (Thor: Ragnarok) is out! Karl Urban’s Dr McCoy must have had the backing of USS Enterprise to help him come through, in a narrow victory (51.67% to 48.33%). (Hmm, I wonder what would have happened if Hela had been facing Karl Urban as Skurge – also Thor: Ragnarok – instead?) Gollum didn’t have too much trouble against King Theodon; David Wenham’s Carl (Van Helsing) vanquished Miranda Otto’s Mary Ann (War of the Worlds), and now needs to be on his guard against the tricksssy Gollum in Round 3. The most overwhelming victory came in Division III, with poor Dwalin no match for Mithrandir – Gandalf took over 90% of the vote in that duel! But perhaps shockingly, Martin Freeman’s John Watson (Sherlock) was able to outwit the mighty Magneto, winning by a margin of less than 1%; and this, in spite of our Facebook ‘exit poll’ suggesting that Magneto would win 60-40! No chance, then, of Sir Ian’s two characters meeting in a later round; Christopher Lee, on the other hand, is throwing down against himself in Round 3, with both his Saruman and his Count Dooku (Revenge of the Sith) having been victorious in Round 2. Does a Sith Lord stand a chance against one of the Maiar? They’re both pretty treacherous, having both turned against their original allies and beliefs; but is a lightsaber a match for a wizard’s staff? You decide – vote now! 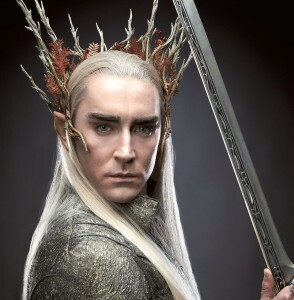 Lee Pace has to fight himself in Round 3, with his Thranduil and his Ronan (Guardians of the Galaxy) both winning their Round 2 battles with ease. Pace fans (is there a name for the Pace Army? ), whom will you choose?? Middle-earth March Madness – Round 2 begins! Some of the results are what one might expect. Galadriel easily overcame Eomer in Division II, with almost three quarters of the vote. In the same bracket, Andy Serkis’ Caesar put up a tough fight, but in the end he was no match for Cate Blanchett’s Hela (from Thor: Raganok), who took just over 60% of the vote. 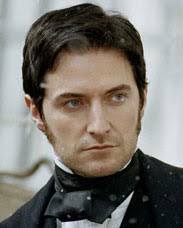 No-one would be particularly surprised to see that Magneto beat John Thornton (Richard Armitage’s dreamy role in North and South, but clearly no match for an X-man); and perhaps it was inevitable, in the clash of mighty wits, that Sherlock Holmes (as played by Benedict Cumberbatch) would beat Oscar Wilde (Stephen Fry). More surprising was the victory in Division I of Gimli over Boromir. In a closely fought duel, the dwarf took just over 51% of the vote, dismissing any hopes of a Boromir vs Eddard Stark show down in Round 3. Fans will be relieved to know, however, that for once a Sean Bean character has stayed alive – thus far! – with Stark beating Will Turner (Pirates of the Caribbean) to go through to the second round. Now he faces Frank Hopkins, as played by Viggo Mortensen in Hidalgo. 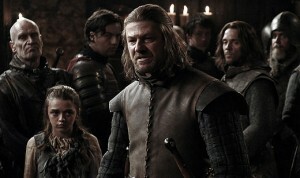 Be sure to vote for Eddard if you want to see a Sean Bean role survive to the end! 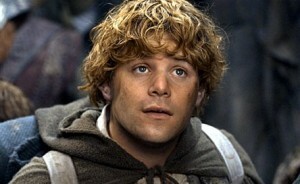 Another upset was the defeat of Ian Holm’s Bilbo by Faramir. The Lord of Gondor’s success may be short lived, however – he faces Galadriel in Round 2. 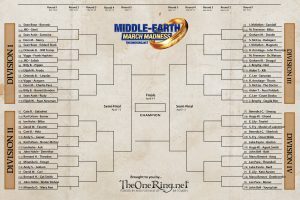 Middle-earth March Madness 2018 is here! Welcome all, to the annual showdown in the realms of Eriador and beyond! Yes, it’s that time of year when hobbit must fight wizard, dwarf must battle elf, and man must face … erm … well, maybe himself. Because this year we’ve thrown something new into the mix for March Madness. We thought it would be interesting to see if Sherlock could outwit the most cunning of dragons; or if Rudy has more heart than Samwise. What would fastidious Oscar Wilde make of the slovenly Master of Lake-town? Can Dwalin out-wrestle Dougal Mackenzie? 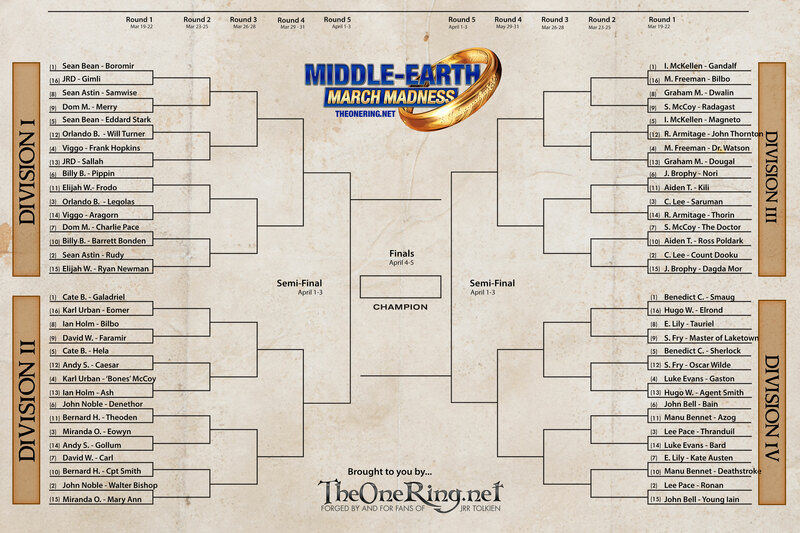 That’s right – our brackets contain actors in both their Tolkien roles, and a role they play in another film or TV show. So Luke Evans appears both as Bard and Gaston; and Billy Boyd is there both as Pippin and Barret Bonden (from ‘Master and Commander: The Far Side of the World’). 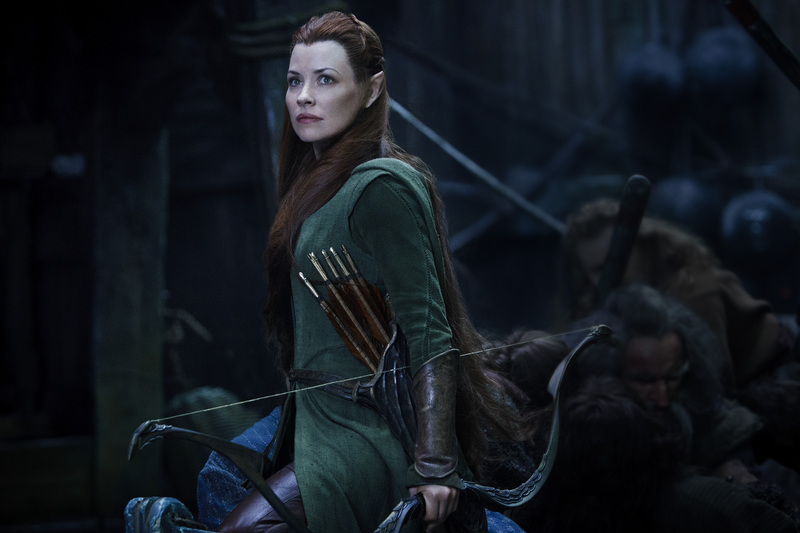 This means that some battles will be between two characters from Middle-earth, some between two ‘outside’ characters, and some will be a mix; and yes, actors could find themselves facing an alter ego. Voting is simple – just click on your choice in each dual, below. You can only vote once – but feel free to share, and rally people to your cause! Speculate on the message boards, and head on over to Facebook to take part in some ‘exit polls’, and see who is predicted to win. It’s all in fun – how you choose your choice of winners is entirely up to you. But if you’re keen to see someone in particular go all the way to final victory, start campaigning now! One of the show-stopping pieces from Comic-Con 2017 has finally made it’s way to pre-order. 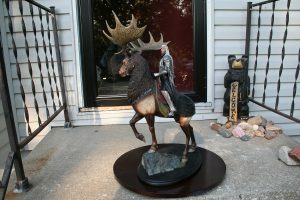 The absolutely amazing Thranduil on Elk, sculpted by Lindsey Crummett, is ready to be ordered and added to our collections. 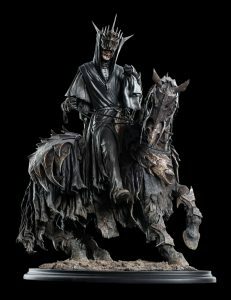 This is Weta’s largest statue ever coming in at 22″ tall, and as detailed a piece you’re going to find. 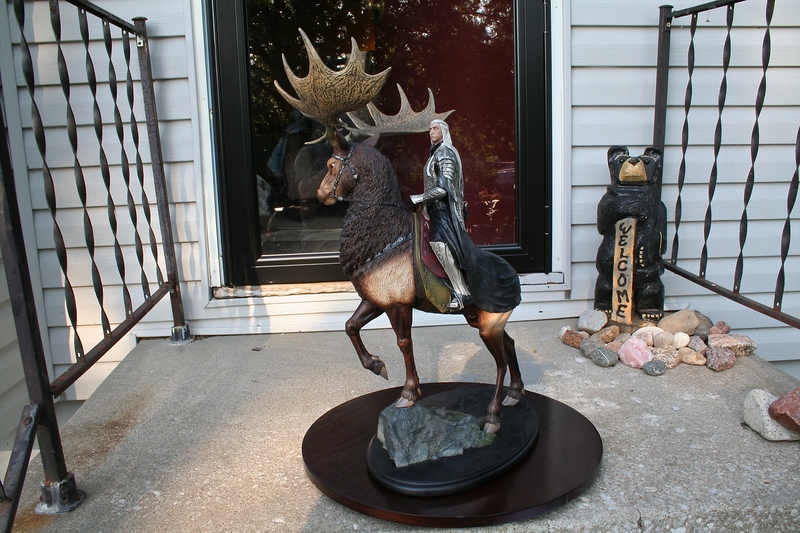 Thranduil has a price tag of $999 and an edition size of only 750 pieces world-wide. Our friends at Weta Workshop have also added a long awaited feature to ordering pieces like Thranduil: for certain pre-order items Weta will now be offering payment plans! Now, we as fans can fit even more goodies into our budgets. However, it will also cause items sell out more quickly, so fans won’t want to hesitate too long and risk things selling out. Today brought us Pre-View Night at Comic-Con 2017 and our friends at Weta Workshop came with some absolutely amazing new items. Some of them you can pre-order right now for shipping later this year and one item that is an amazing preview. 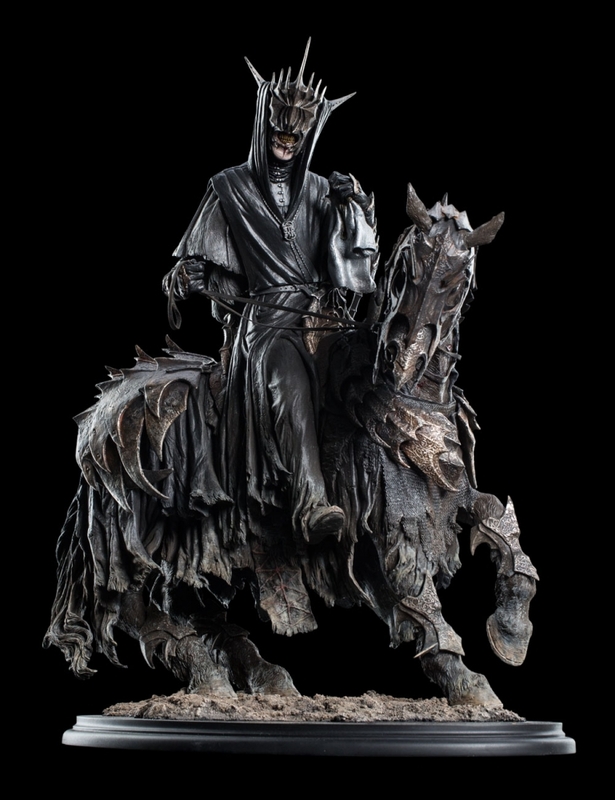 Grond is an item we’ve gotten a chance to see at various cons and now we finally get a chance to order this awesome piece. Fans can order Grond right now for $749 and with an edition size of only 500 pieces this will not last long. This next piece is another on the list of items we have been asking Weta for, it is the Mouth of Sauron. The Mouth of Sauron comes to us on his horse covered in that awesome armor all while holding Frodo’s Mithril Shirt. Coming in with a price tag of $699 and an edition size of 750 pieces this is another item that is sure to not last long. Digital HD UltraViolet is also available which must be redeemed by November 17, 2018. The cover art on Amazon’s site differs for each version. Following is a discussion of each, and links at which you can pre-order your copy. 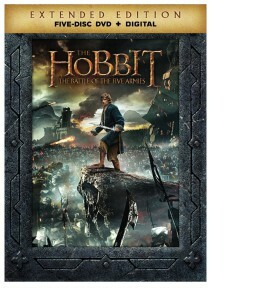 The DVD version cover features Bilbo (Martin Freeman) with Sting drawn, overlooking the evil armies amassing, and the battle raging below him. The border, which is the same for all three formats, is a steel-gray color with a design reminiscent of dwarf-runes seemingly carved into it which adds a nice touch to these last extended editions of the series. One of the carved dwarven sentinels of Erebor watches over all on the right while the ramparts of Erebor and the burning remnants of Lake-town are visible in the background on the left. The Blu-ray cover is more character-centric than the DVD cover. Our hero Bilbo is front and center, again with Sting drawn. A thoughtful, but stern, Gandalf (Sir Ian McKellen) is on Bilbo’s right, while a very stubborn, impatient and disturbed-looking Thorin (Richard Armitage) is on his left. 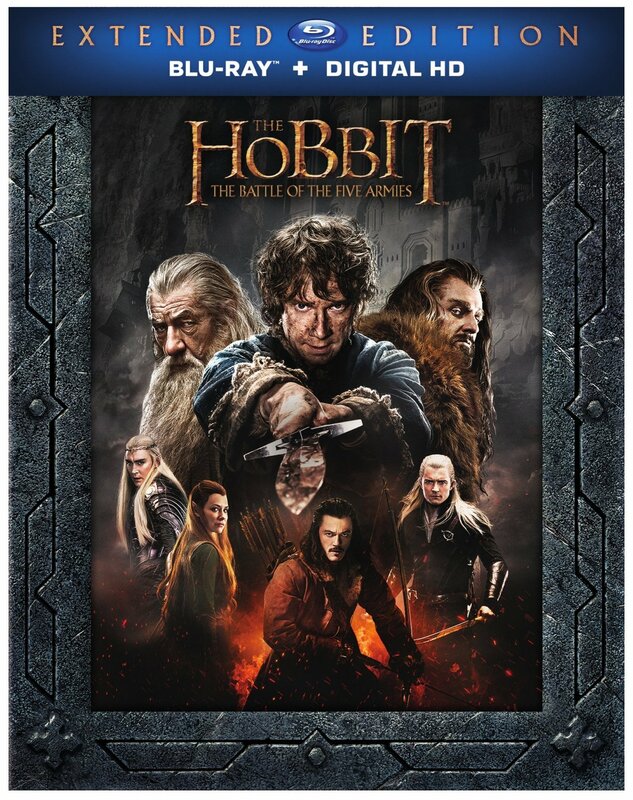 The Elves are well-represented on this cover with three of the four smaller figures in front of Bilbo being comprised of Thranduil (Lee Pace), Tauriel (Evangeline Lily) and Legolas (Orlando Bloom). Last, but not least, stands Bard the Bowman (Luke Evans) with the glow of the fire of Smaug and the burning Lake-town behind him. 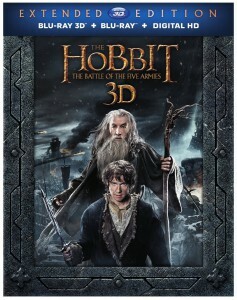 The 3-D/Blu-ray cover is striking, with just the characters of Bilbo (Martin Freeman) and Gandalf (Sir Ian McKellen) standing behind him protectively. As with the DVD cover, the sentinel of Dale is just off to the right, only this time with a great battle-troll below, and the ramparts of Erebor and vestiges of a burning Lake-town are off the the left, with the battle raging behind all. As if to emphasize that this is *the* battle, Bilbo again has Sting drawn and ready to do battle with the enemies. A nice touch with this cover is that Bilbo’s mithril shirt is clearly visible underneath his plainer clothes. 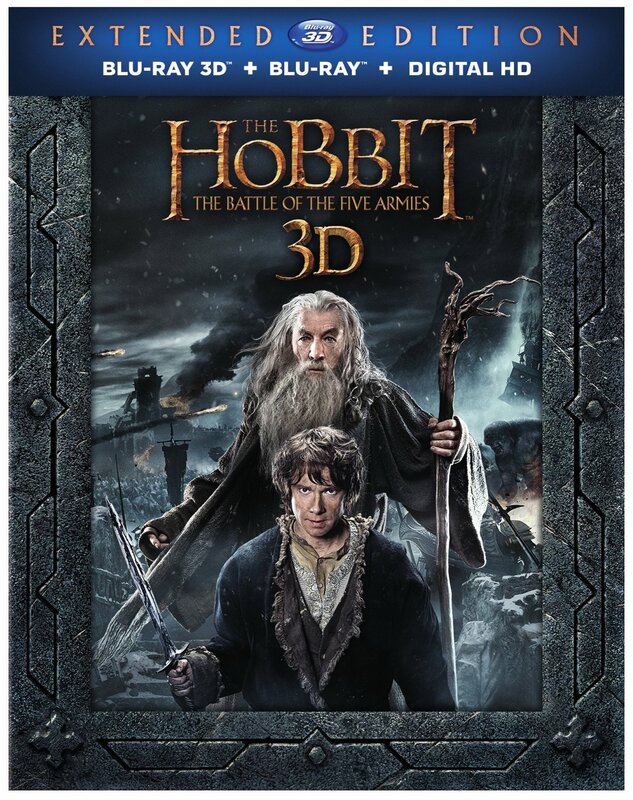 Definitely stay tuned, as we will bring you more BotFA analysis as details become available (e.g., releases in other countries, releases in other retail outlets, special incentives). Note that we did check Amazon’s sites for other countries but didn’t find the EE available yet. If you don’t live in the U.S., definitely let us know if and when it becomes available in your corner of the world and whether the amenities are the same, and we’ll add it to future updates.